Project of modern Swedish apartment, designed by Alvhem Mäkleri & Interiör Company acts as a rare work of art, where the simple things are made to look attractive and pretty. The company normally makes use of easily available objects, which are not only inexpensive but offers their surroundings a unique look. The furniture normally used in project of modern Swedish apartment, when designing the home interior are sleek and tend to occupy less space. They are light weighted and have a stylish look. The rooms are mostly painted in white, which makes them appear more illuminated and less cluttered. 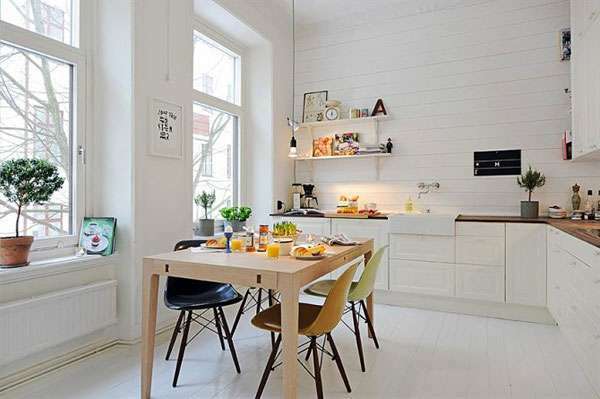 The white walls and the floorings makes the rooms appear much more spacious and radiant. The lampshades used in the apartment are plain and simple. The home gadgets though look ordinary but actually are extremely sophisticated in nature. The splashes of bright colors in Project of modern Swedish apartment avoid the rooms from appearing boring and monotonous. The small accessories and articles make the home interior more interesting. The white wooden flooring has been beautifully adorned with different types of mats and carpets. Most of the furniture in the bedroom, kitchen and sitting area are white in color and simple in design. Everything has been arranged in such a manner, so that there is enough free space, for moving, inside the apartment.